The more details emerge about yesterday's deal between the City and Wilson Blanchard, the less there is to get excited about. Ward 2 Councillor Jason Farr presented a compromise solution via a motion [PDF] at yesterday's planning committee meeting that would see the 1840 building at 18-22 King Street East preserved, while the buildings at 24 and 28 King East are demolished. Wilson Blanchard, which owns the buildings as well as other properties on that block, submitted a demolition permit request to the city in December to demolish 18-28. Under this new deal, they will withdraw that demolition permit from applying to 18-22. Wilson Blanchard also agreed that 18-22 may be added to the city's register of historic buildings of interest. Once the permit has been revoked - that demolition permit for 18-22 King Street East - that those addresses now be placed on the municipal registry of property of culture and heritage value or interest. So [Wilson Blanchard is] taking it out and allowing for it to be added to the buildings of interest list. The problem with that list is that it has no force of law. Under the Municipal Heritage Act, a property owner must ask permission to demolish a building that has been designated under Part IV of the Act, and the City has the power to deny the request. Merely adding a building to the register of properties of interest does not designate it under Part IV of the Act. In short, the City has agreed to let Wilson Blanchard demolish 24 and 28 King East in exchange for a non-binding promise to preserve 18-22. There is absolutely nothing to stop Wilson Blanchard from reapplying for a demolition permit for 18-22 in the future, and the City will have no power to refuse the permit. Worse still, Wilson Blanchard VP David Blanchard was quoted in CBC Hamilton yesterday saying he plans to "rip the back half off the buildings" and only keep the front half. The company still needs to do an engineering study to determine whether and how best to do this and incorporate the facade of 18-22 into a proposed new development on the block. 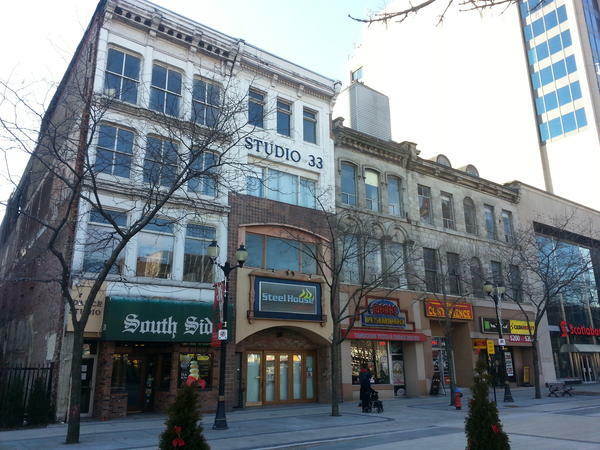 In the meantime, the demolition of 24 and 28 King East can proceed at the owner's discretion. Councillor Farr is presenting this as some kind of victory, but Ward 1 Councillor Brian McHattie, who sits on the Heritage Committee and has long been an advocate for heritage preservation, is less sanguine. McHattie decried the City's lack of interest in heritage preservation after the permit was issued, saying there is "a war on heritage buildings" at Council. After yesterday's decision at planning committee, in which the councillors defeated a motion to add 800 downtown buildings to the City's registry of buildings of historic interest, a despairing McHattie told CBC News, "At this point in time, I have no hope that cultural heritage has a future in Hamilton." McHattie was instrumental in saving the Lister Building after Council voted to approve a demolition permit request. At the time, McHattie appealed to the Ontario Minister of Heritage to intervene and broker a solution. This time around, a citizen campaign was launched calling on Ontario Minister Michael Chan to designate the building, but a recent article in the Globe and Mail reports that Minister Chan considers this a local matter. Update: edited to clarify that Councillor McHattie's frustration was related to a defeated motion to add 800 buildings to the heritage registry. You can jump to the changed paragraph. To be fair, it was not this decision that caused Councillor McHattie to leave the room in disgust, which he did. In fact, he was eloquent in his explanation of the compromise. It was McHattie and Farr who put the compromise deal together. The reason McHattie was so incensed was because of the reaction by Councillors on the Planning Committee to a motion to add 800+ buildings to the heritage registry list (not designated, but listed). The move was an attempt to increase the wait time for the approval of a demolition permit from 20 days to 60-80 days. If I'm wring on this, I more than happy to be corrected. To be clear, listing a property on the municipal register of cultural heritage properties does not increase the wait time for the approval of a demolition permit. As per subsection 27. (3) of the Ontario Heritage Act, the owner of non-designated property included on the register shall not demolish or remove a building or structure on the property or permit the demolition or removal of the building or structure unless the owner gives the council of the municipality at least 60 days notice in writing of the owner’s intention to demolish or remove the building or structure or to permit the demolition or removal of the building or structure. This is not about extending the Chief Building Official’s response time to a demolition permit application as defined under the Ontario Building Code Act but rather the obligation on the property owner to provide council the opportunity to consider alternatives to demolition. Keep in mind that not all buildings required a demolition permit. Even where a demolition permit is required for a building on a property listed on the municipal register, the Chief Building Official’s response time remains as defined under the Ontario Building Code Act. The difference is that subsection 8. (2) of the Ontario Building Code Act instructs the Chief Building Official to deny the applicant a demolition permit for buildings on a property listed on the municipal register, within the prescribed response time, as it would be in contravention of subsection 27. (3) of the Ontario Heritage Act as applicable law. Even in the event that a demolition permit was granted in error, the property owner must still satisfy their obligation under subsection 27. (3) of the Ontario Heritage Act. Only once the 60 days notice period has expired and council has not issued a notice of intention to designate as provided by the Ontario Heritage Act, could a property owner proceed with demolition of the building consistent with any requirements under the Ontario Building Code Act. To be clear, listing a property on the municipal register of cultural heritage properties does not increase the prescribed wait time for the approval of a demolition permit. As per subsection 27. (3) of the Ontario Heritage Act, the owner of non-designated property included on the register shall not demolish or remove a building or structure on the property or permit the demolition or removal of the building or structure unless the owner gives the council of the municipality at least 60 days notice in writing of the owner’s intention to demolish or remove the building or structure or to permit the demolition or removal of the building or structure. This is not about extending the Chief Building Official’s prescribed response time to a demolition permit application as defined under the Ontario Building Code Act but rather the obligation on the property owner to provide council the opportunity to consider alternatives to demolition. Keep in mind that not all buildings required a demolition permit. Even where a demolition permit is required for a building on a property listed on the municipal register, the Chief Building Official’s response time remains as prescribed under the Ontario Building Code Act. The difference is that subsection 8. (2) of the Ontario Building Code Act instructs the Chief Building Official to, within the prescribed response time, deny the applicant a demolition permit for buildings on a property listed on the municipal register as it would be in contravention of subsection 27. (3) of the Ontario Heritage Act as applicable law. Even in the event that a demolition permit was granted in error, the property owner must still satisfy their obligation to advice council as per subsection 27. (3) of the Ontario Heritage Act. Only once the 60 days notice period has expired and council has not issued a notice of intention to designate the property as provided by the Ontario Heritage Act, could a property owner proceed with demolition of the building consistent with any requirements under the Ontario Building Code Act. That's correct - thanks for pointing it out. I've updated the article to clarify. So no buildings are being saved here. Only the facade of the Thomas building. Not good. What a waste of a local treasure, what a shame. At the very least I would like to see the duplication of the other buildings' facades. And let's not forget the street frontages on James and Main here and what sort of designs they will incorporate. According to the current plan, the front half of 18-22 will be renovated into streetfront retail with apartments upstairs. The back half, behind the interior courtyard (visible from Google Maps), will be demolished. I'm sure some floated the idea of settling for an historic patina, but you can always trust council to keep up a facade. Nothing more important than the appearance of caring. incredible. Those 2 white buildings have always been my favourites. They are incredible. And have been occupied for years. Nothing a good renovation can't handle. The Gore will never be the same with some lame glass building there instead of those gorgeous arches, beveled glass and striking white facade. McHattie is absolutely right. There's a reason why the world's most favourites cities are the worlds most favourite cities. From Boston to Paris back to Montreal, the restoration of their historic buildings along walkable streets are why people fork over tons of money to go visit. Even Toronto which hasn't done well with it's heritage has seen the Distillery District become one of it's most loved destinations and signature neighbourhoods. Hamilton once again gets it wrong. Nothing a good renovation can't handle. So now you're a structural engineer? And I suppose you're ponying up the money for the "renovation?" Sometimes you just have to accept the smallest of victories. destroying the heart of our city, in a city whose biggest draw to the next generation of residents and companies is our heritage buildings, is not a victory. I would pony-up if I owned the buildings. Market rate (Chesters is at $580) I would make an offer if it were on the table. He probably bought the building for $100 grand. You really have to stop with this "other ppls money thing" it just has no legs. We will not compromise on even the smallest part of any building older then 45 years (Not Jackson Square though, you can demo it). Even if the original facing and architecture of the buildings has been replaced, even if it has become structurally unsound, even if the rear of the building is boarded up and is a mass of decaying brick and rusted fire escapes, even if it means a new development that promotes the kind of density we believe is needed for the urban core, even if it means said new develoment will get rid of a mass of surface parking in it's large footprint that would make said development more economically viable, even if for the last century it has been neigh unrentable and has had a revolving door of tennants, even if similar and better examples of similar architecture and facades exsist down the road (See Victoria Hall), even if the large office tower directly next door has stood for some time and compliments the arcitectural style of the new development, even if the developer actively makes a compromise to preserve other parts of said development out of his own pocket, even if said compromise is reasonable and is regarding buildings the developer owns and have never held a heritage designation and perpetual covenant with the government regarding it's preservation, we will not compromise! We are the Tea P...I mean the Hamilton Heritage Advocacy Group! No brick can ever be removed, ever...even when if it likely will do good. Developers must build on parking lots they don't own, or build on the outskirts of our city and encourage sprawl if they want to build something new. Now, I'll admit there may be some unfair satire there, as I know there are resonable heritage advocates out there, but really this seems like more then a reasonable compromise from the developer and frankly he's gone far further then I would have. "...even if it will likely do good." I think you and I have different definitions of "likely". If we were presented with concrete plans that I felt were "likely" to happen, I'd have a much harder time advocating heritage. But when we're presented a pie in the sky plan that shows shaped coloured boxes and the partners themselves bicker to the media about whether or not a condo will even be part of the end result, I worry, and I wil fight the demolition of the buildings in those circumstances - with no concrete plans to move forward because my fear is that we will be left with an empty parking lot for years. That is, I think, the main difference between my view of this situation and yours. Pompeii’s longstanding problems have stymied a succession of Culture Ministry archaeologists entrusted with its conservation. Stefano De Caro, who oversaw the archaeological work at Pompeii from 1977 to 1984, says the site’s woes stem from Italy’s shortsighted budget policies, which have kept it in a near-constant state of crisis. The new conservation strategy of Pompeii will be focused less on restoring individual monuments than on comprehensive maintenance, including improved water collection and disposal. Conservators say that many recent collapses were the result of bad drainage and the slow erosion of the ancient mortar. Officials say the Great Pompeii Project has a better chance of succeeding where other plans have failed because it is a comprehensive strategy involving three ministries: Culture, Interior and Territorial Cohesion. Economic development officials examine the investment potential of bids, while Interior Ministry officials make sure they are awarded to companies without ties to organized crime. There are also timid advancements to introduce private sponsorship at the site, much in the same way that the Packard Humanities Institute has made the nearby Herculaneum, also buried by Vesuvius, a model site for archaeological preservation.